So, you want to watch a video in Youtube. You open your Google Chrome browser, heads over to Youtube, searches for the video and starts playing it… well not yet. 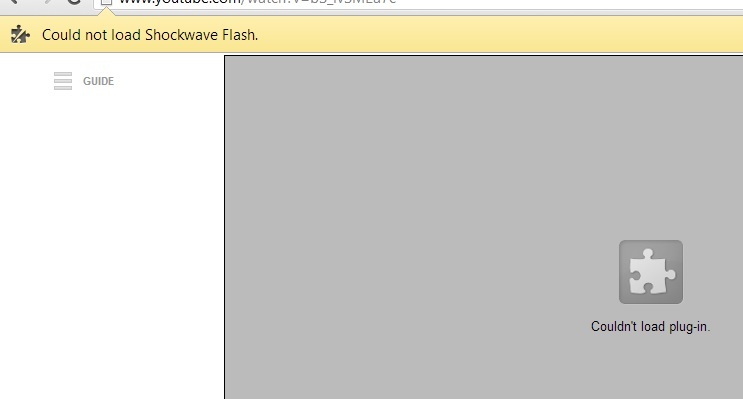 Because you are greeted with the errors ‘Couldn’t load plug-in’, and ‘Could not load Shockwave Flash’ as seen below. Frustrating, it is. So, now what? 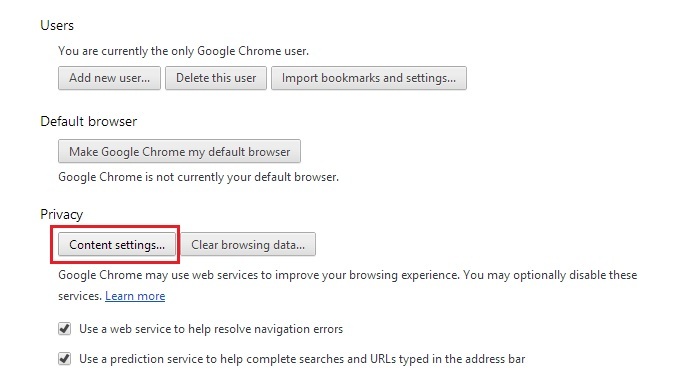 You can try re-installing the browser, but that won’t fix the error. You will continue to get the same message. Let’s see how we can fix this very easily. Yes, its very easy! Before we start, there are two directions you can take – both will take you to the same location. I will describe both here, so you can decide which fits you better, or helps you to follow better. 1. Click on the Customize button on the right-side on the menu bar to open up the list of options. Click on Settings. 2. A new tab will open up. 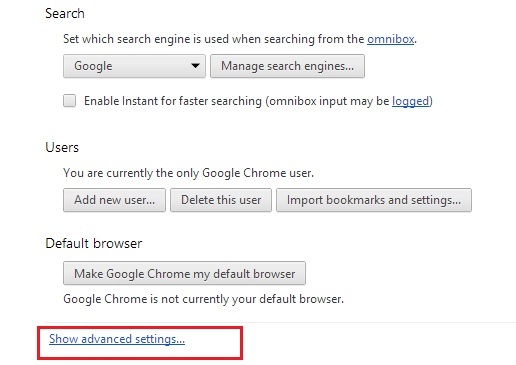 Scroll down and click on Show Advanced Settings. 3. More options… Find the heading ‘Privacy’ and click on Content Settings. 4. The Content Settings dialog box shows up. Scroll down and find Plug-ins. Click on the hyperlink ‘Disable individual plug-ins. 5. Another tab comes up with the list of installed plug-ins. Wait here for a second as I’m going to show you how to reach the same tab directly without all the above long steps. 1. Simply open a new tab and type the following in the address bar. chrome://plugins/. 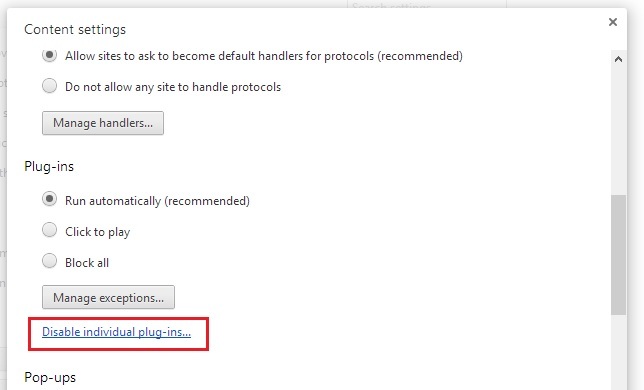 Ok, so now we are here at the plug-ins tab, lets see who is the one causing the plug-in error which prevented us from watching videos in Chrome. The error did mention ‘Shockwave Flash’. 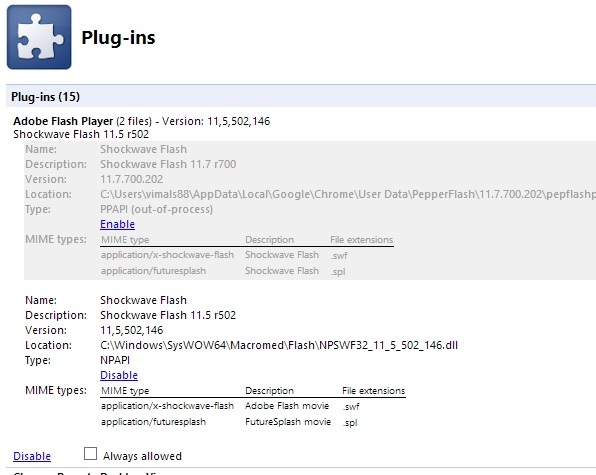 So find the plug-in Adobe Flash Player – Shockwave Flash. You would find two versions of the same plug-in installed/enabled. But you need just one! Yes, only one is fine. Click on Details to see more options for the plug-in. Now you see both the versions with a Disable option attached to each one. Disable the one version that points to C:\Users\.. and keep the version pointing to the C:\Windows\.. enabled (As shown below). Now, open a new tab/window, open Youtube and play a video. Voila! Enjoy! 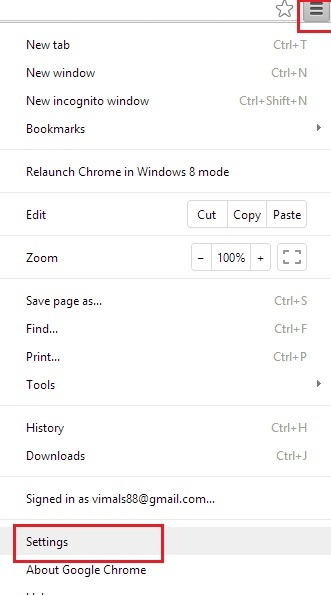 Hope this helped you to save yourself the time to install another browser. Share your thoughts below. Well, this one is not so difficult as it seems to be. Just follow the below steps and leave the phone alone, connected to the PC for 30 minutes. You can easily and safely upgrade your firmware version Android Froyo 2.2 to Gingerbread 2.3.6. This is for the official upgrade which was pushed via Samsung Kies. So, there is no need to root your phone, and it will still stay rooted after the upgrade as well. 1. My upgrade experience proved that you won’t lose any existing data in the phone including the applications after the upgrade, if you do it correctly. But, to be on the safer side, its always a good idea to take backup of the files and contents in the phone before we start to play with it. 2. So, take backup of your Contacts, Memo, Calendar and media files using Samsung Kies. 3. Take backup of SMS using the application SMS Backup & Restore. 4. Take backup of all the Call Logs using the application Call Logs Backup & Restore. 5. Note down the GPRS and other internet Access Point setting details. 1. Enable USB Debugging in the phone (Settings — Applications — Development — USB Debugging). 2. You can keep the sim card and SD card in the phone itself as I did, but again, to be safe, remove both SIM and SD cards from the phone, as both are not required anyway for the upgrade process. 3. Connect the phone to the PC. 4. Copy, Export and Backup all the required data to the PC. 5. You may be asked to upgrade the version of Kies itself before proceeding with the firmware upgrade. So make sure there is no such messages. 6. Make sure the PC is connected to internet and is working fine. 7. Charge the phone to atleast 80% in order to avoid the phone from getting switched off during the upgrade process. 1. When you connect the phone and start Kies, you will get a message saying that a new firmware version is available to be upgraded for the phone. Once you make sure that all the data are safely copied, click on Upgrade. 2.Keep the phone connected to the PC and don’t let it get disconnected at any stage of the process. 3. Kies will download the firmware files and the phone will restart and go into Downloading state automatically during the process. 4. The process will take upto 30 minutes depending on the internet connection speed and will display a message once the upgrade is over. 5. As instructed on screen, disconnect the phone and reboot it. You will be able to see changes in the icons already. 6. Re-insert the SIM and SD cards. 7. Connect the phone back to the PC and make sure everything is fine. Let me know if you are still having doubts or have faced any issues after following the above steps. അനുരാഗത്തിന്‍ ….. , വരമായ് വന്നൊരു ….. It seems that many of you have the issue in moving the photos from the Mobile uploads album to any other album. Well, you can still do it, but with an additional step. 2. You will see all the photos there. On the top-right corner, there is an option to ‘Edit’. Click Edit. 3. Now, you are in the same page as the other edit albums window. Proceed and hover the mouse over the image and you must find the option to move the photo this time. Here we go. It’s been quite some time since I last posted a tech tip in the blog. So here I am, back again with another small tip which could be really helpful for many of you, just like me until I figured out how to do it! 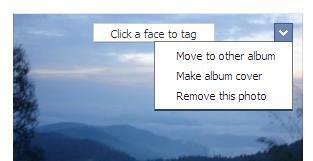 This tip is on Facebook, and its photo management. We all have taken pics and uploaded them from time to time in Facebook, but there would be times when we got caught up thinking like we could’ve posted a particular photo into a different album rather than the one its already in. Well, there was a easy to understand way out of it in the ‘older’ version of Facebook. But as they made all the cosmetic changes to the layouts and designs and appearances of many different things including the introduction of Timeline, things got more complicated. So, now if you need to move that particular photo out and place it in another album, its going to be difficult. Now, no one would want to delete the photo and then re-upload it, especially if it has received any likes or comments. So, whats the way out? You want to move a photo from album which you feel is not the right place for it to be in, and to put it into another one, without the loss of any likes or comments it received, and without having to go through the delete-re upload process. Here are the steps to fix this in the new Facebook layout. 1. Goto your profile page, and click on Photos to open up your gallery of albums. Select the album which contains the photo that need to be moved. 2. You will be able to see a thumbnail view of all the photos in the album. Click on Edit Album at the top of the screen. 3. An edit window will appear with all the photos ready to be edited with the descriptions, date, place or tags. Hover the mouse over the photo which you want to move. 4. 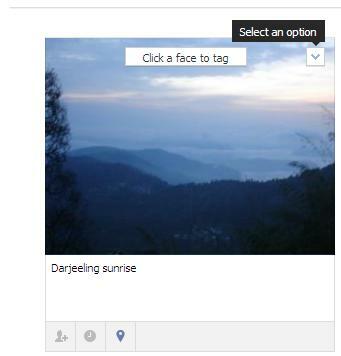 On the top right side of the photo, you will see a small down arrow, which when clicked will give you a drop-down menu. 5. One of the options in it will be to Move to other album. Click on it and another small drop-down menu with the list of all other albums will show up. Select the album to which you want to move the photo to. Once you select Move Photo, the process gets completed. 6. Now check the second album and all the moved photos should appear there. That’s it! If you are still facing the problem, and haven’t been able to follow these steps, let me know. !